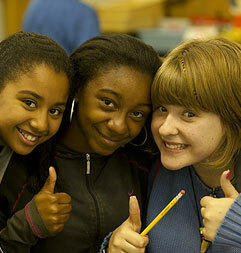 By any measure, CLC Schools are consistently among the highest performing schools in Alameda. CLC Schools have never made a practice of "teaching to the test." Our model is based on helping learners set high expectations for themselves and creating an empowering learning environment that supports meeting those expectations. Our experience and track record has shown that self-directed and project-based learning fosters remarkable achievement no matter the measure — test scores, college acceptances, community contributions and real life accomplishment. Our approach creates lifelong learners who continue on that path to college and beyond. *The Academic Performance Index (API) is a California school performance measurement system used to evaluate how well a school performed in a given year, as well as to track school progress over time. APIs range from 200 to 1000 with the target goal for schools being 800. Each year, the state calculates a school's Baseline API, sets an annual API Growth target, and then evaluates the school's annual growth in API in light of that target. The Base API is calculated using a school's test results from the California Standards Tests (CSTs — measurement of state standards), the California Modified Assessment (CMA), the California Alternate Performance Assessment (CAPA) and the California High School Exit Examination (CAHSEE). CLC Schools always strives to serve our community to the highest standard, but sometimes problems develop that we are unaware of or a situation deteriorates. The link below provides general information from the California Dept of Ed about Uniform Complaints: what they are, what programs/services are covered/not covered, how to file a complaint, and responsibilities of complaintant, local educational agency and CA Dept of Ed. Intensive instructional services not being provided to pupils who have not passed one or both parts of the high school exit examination at the end of grade 12. This form contains the elements required by California Education Code Section 35186 and 5 CCR Sections 4600-4687.